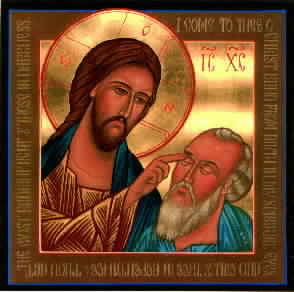 Greek Icon–Jesus healing Blind Bartimaus. The one characteristic, I believe, that describes life in this country and in this twenty-first century is fear. For example, during this election of 2012 the airwaves are filled with advertisements advising us to fear the election’s outcome. We live in a constant state of fear that terrorists will blow up some important building, poison our food supply, or makes all sick with a deadly illness. We live in fear that our money will disappear or that the government will put all in concentration camps somewhere and for some unknown reason. In the church we live in fear that some strange people will be allowed in and upset our tranquility, our place, our sacred space. We live in fear that the bishop will swoop down out of his palace and take away our assets, and close our church doors for ever. In our personal lives we live in fear that we will die from some terrible illness, or that we will end up in poverty. While most of us live in relative comfort and have little reason to be fearful there are many in this country that have legitimate reason to worry about the future. They are the unemployed who have a bleak immediate future. They have reason to worry about how they will house and feed their families. Nevertheless, they too need not live in fear. However, those of us who are comfortable need to be cognizant of the conditions of others and be generous in refusing to stigmatize them as shiftless and seek ways to raise everyone to a level of fruitful living. After all, generosity must be a hallmark of Christian living. Acts of goodwill toward the needy and a generous spirit are not intended to keep those in poverty from rioting in the streets or avoiding the ravages of hell but instead the results of faith in the loving Father of Christ Jesus. As Christians we are to do nothing out of fear that we will be condemned by God but instead do everything from profound gratitude that we are given the insight to see need and the ability to meet it. To be honest, however, there is much to fear and good reason to be fearful—that has always been true. I was born in the midst of the Great Depression. Initially reared in poor family surroundings where every penny brought into the home seemed like a miracle. The result, my parents never stopped being fearful about money—a fear that whatever they had would be lost or that no matter how much they had it would never be enough. Additionally, I was born a year after Adolph Hitler came to power and set off the greatest world war in human history. Since the 1930s, I have lived a lifetime of fearful conflict—World War II, the Cold War, the War in Korea, the war in Vietnam, and now the “War on Terrorism.” Finally, I have been in war and experienced the momentary fear of instant death, followed by hours of boredom that characterizes war for many soldiers. Just based on experience, there is much to fear. Further, Christian living, sadly, is often marked by anger, insularity, power, and over opulence. The church that sprang from the teachings of a man who reached out to the poorest, the sickest, and most rejected in the social structure, has over the past two millennia become an institution based in power and wealth. It doesn’t matter what kind of Christian group it is, eventually the institution seems to matter more than the message. All the same, the Church is worthy of defense and continuation as an institution. Our work is to assure that it always reflects the teachings of Jesus more than it protects its institutional structure. Even when Jesus was at the height of his Galilean ministry his followers were fearful. They were fearful that their special place in the Jesus’ inner circle—the in crowd—would be challenged. In that challenge, when the New Order was established, they would be left out of the political hierarchy. After all, they claimed having given up much to be a follower. The story of blind Bartimaeus is for me is the pivotal story of our faith. Think about Bartimaeus for a few seconds. He knew fear. Had you sat on the side of a dusty road, blind and without hope, you would experience the same despair. Yet, in the incident reported in the Gospel according to Mark, he was fearless. Bartimaeus was not going to let his fears or those of others get into the way. Jesus for him was, in fact, the answer. Bartimaeus was not a follower Jesus. He was not a part of the crowd that walked with Jesus from Galilee to Jericho; he was a beggar sitting at the side of the Jericho Road. I would say that he had no hope until he heard of Jesus. Hearing of Jesus is not the same as knowing Jesus. For Bartimaeus Jesus was the hoped for Messiah, the “Son of David” the hope of all Israel. Further, it is likely Bartimaeus heard of Jesus the wonder-worker and that also gave Bartimaeus hope. Whatever that slim connection of hope was, he had no hope of ever encountering Jesus. Bartimaeus had never seen Jesus, never heard him speak, and wasn’t certain he would ever be touched by Jesus—in fact, he never was. Nevertheless, he had faith that if he ever encountered Jesus, Bartimaeus’ world would be changed. Maybe this wonder-worker would restore the beggar’s sight. In that Jericho crowd everyone was blind. No one truly knew what was ahead of them. I even suggest Jesus was blind in a way. He did not know precisely how his messianic ministry would play out. No doubt Jesus knew he would be subject to arrest but possibly not until he prayed in Gethsemane that Friday morning did he fully grasp the agony he faced. A few weeks earlier Jesus seemed to have come finally to terms with his life’s mission. After encountering Moses and Elijah on the mountain, he heads south down the Jordan Valley and begins his fatal journey to Jerusalem. Blindness is not simply a loss of eye sight; blindness is an inability to imagine, to be open to possibility, to understand one’s divine call. The beggar on the side of the Jericho Road probably had the imagination to believe that an encounter with Jesus would be life changing. Jesus has another idea. He tells the in-crowd go and get that man at the side of the road and find out what he is shouting about. What a shocker! Jesus wants to know what that dirty blind beggar wants. They, the in-crowd, thought they knew what Bartimaeus wanted, it was money. They probably told Jesus, “Throw some money at him so we can go on our way.” So much of charity is like that; throw some money at it and go about the business of ignoring the true need of personal involvement. The in crowd probably thought their mission was to go to Jerusalem and face down power and thereby become powerful. Jesus, on the other hand, must have understood something different. He was now beginning to see that he was called to be the sacrifice needed to reconcile the world to God. Therefore, the dirty blind beggar making such a fuss at the side of the road was the person, the epitome of need, the reason for the sacrifice Jesus has been called to make. Here’s what I ask Jesus to do: First, just stay with me; help me remain faithful. Second remove the blindness that prevents me from seeing Christ in and through others. Third, make me fearless. In Christ I have nothing to fear. Regardless of what the future may hold Christ is still here. Worry seems to be the world’s number one preoccupation. We see it in the election claptrap that bombards us. Worry about the budget, the deficit, Social Security, and Medicare. Worry that there are people out to get us and only so-and-so will save us. You have heard, certainly, the saying, “If you worry about something about your future now and it happens you have worried twice. If you do not worry about your future now and it happens you have worried only once.” Worry, fear, reduces us to thoughtlessness. Worry, fear, keeps us from living imaginatively. Worry, fear, saps our life’s strength and keeps the Spirit of God at bay. For example, if people stop coming to worship, as Casey Stengel is reported to have said, “You can’t stop them.” Nevertheless, Christ is still present. If the Church runs out of money, which it won’t, Christ is still here. So, what do we ask of Christ when he says we should? We ask only that Christ be present, which he is. Bartimaeus believed without seeing, without hearing, and without being touched by Jesus. We have Bartimaeus as the image of ourselves. We sit blind at the on the side of the road begging for love, for hope, for something (sometimes we don’t know what), but we can live as Bartimaeus did hopeful and faithful. In that life of hope and faith, when Jesus comes near, we can throw off whatever prevents us from seeing and leap to our feet unafraid of the future knowing we are walking on the road with Jesus. What great life that is! This is a particular concern of very small congregations in rural communities. No doubt even in metropolitan areas bishops of hierarchical Christian divisions have closed congregations on the basis of money rather than need of the local population. Although argument is made on the basis of fiscal responsibility, fear is the main reason for the actions.